It’s the most wonderful time of the year! People are decorating their homes inside and out, cooking delicious treats and thinking of the perfect gift to give to a loved one. One of the best parts of the holidays is not always the actual day, but the spirit leading up to it. The wonderful thing is that this is different for everyone! We wanted to share with you what gets all of our team members into the holiday spirit! I love to craft! Each year I scour through Pinterest to find my newest project. This year my healthy collection of wine corks was taking over one of my baskets so I went searching for an idea. Low and behold, the wine cork wreath kept popping up. So, I grabbed a wreath mold, some cranberry bundles and leftover buffalo plaid ribbon from another wreath I made and began the glue gun extravaganza! It took me about 3 hours in total and perhaps another bottle of wine to get through the project! It really was fun. I love the process of creating something and who doesn't love a great glue gun project! What got me into the holiday spirit this year was attending my first team Suzanne & Company breakfast, followed by a secret Santa! It was so fun to start the day off with a yummy breakfast and some mimosas! We then followed that eventful morning by going shopping for some holiday greenery and Christmas decorations. There have been a few things in particular this year that have gotten me in the holiday spirit. First is when my son Sam opened the box for his Elf on the Shelf a week ago - we had never had an elf before as he was too young, but we are knee-deep committed with the little guy as Sam gets SO EXCITED to find him each morning. The elf has yet to help with bedtime, though. The second is when my friend Kathy, who is a baker made these amazingly decorated Christmas cookies for an ugly sweater party we attended last weekend. Not only were they delicious, but they were so cute too (my favorite is the leg lamp one!). And lastly for the same ugly Christmas sweater party, another friend brought their Polaroid which we used to take photos of everyone - the photos were later used in ornaments which came out so cute and so retro! As many of you know I am obsessed with Christmas and so is my family! Wes' nickname this Christmas is "Mr Christmas" . 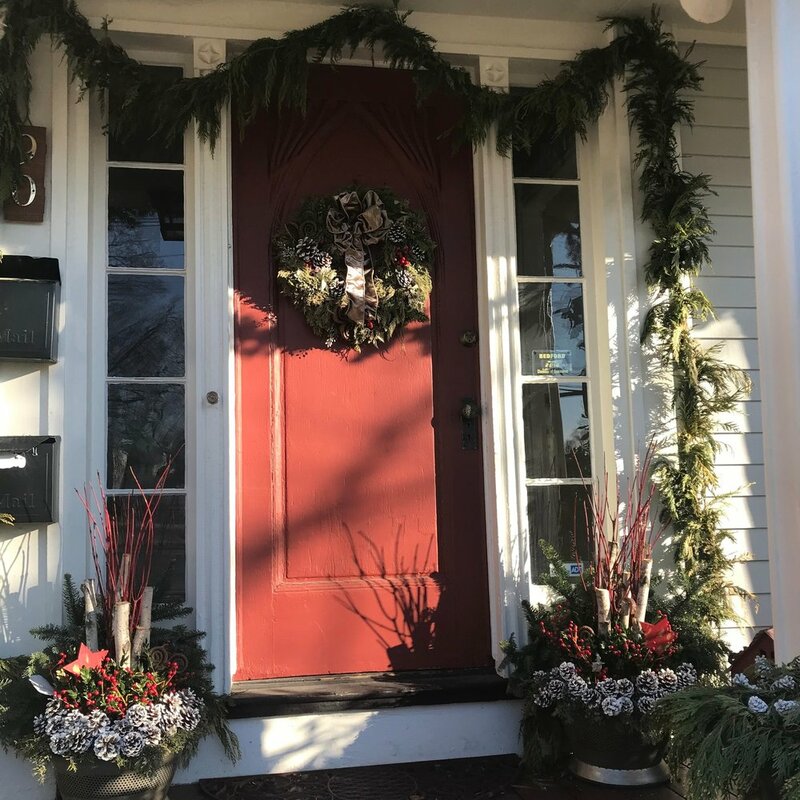 We have a lot of fun traditions, including decorating every inch of Someday Farm which was on the Holiday House Tour this year, and we added a cool sign made form an old headboard and 2 huge wooden snowflakes to our outdoor decor. Christmas Eve is my absolute favorite day of the year. I cook a roast that we purchase from a local farm in Groton, and we host a big dinner complete with popovers, a roaring fire, and the Schmuhl tradition of drinking a Scarlet O'Hara- Soco, cranberry and a lime in a vintage Christmas glass from the 60's! We go to church around 4pm and enjoy the instant pageant and singing, and then it's home to eat the above dinner and wait for Bedford Santa to visit. This is one the VERY best parts of living in this amazing small town and it makes my heart happy. I look forward to one day volunteering as an elf when our kids our older. My family’s favorite thing to do each year to kick off the holiday season is to attend the tree lighting in both Burlington and Bedford! The event is always so cheerful and a great way to get into the holiday spirit. We also love to pick out our tree together and decorate our home. When our kids were little, our tradition was to take them to Santa’s Village which was always a fun time! We started a Christmas morning tradition when our youngest, Eloise, was a toddler of hosting a Christmas breakfast at our house. We have family, friends, and neighbors for breakfast, coffee, cocoa, mimosa, and a yummy Bloody Mary bar. It’s such a fun and festive event that has grown over the years, this year we will host between 30-40 people.